Boston Leather police garrison belts are made with high quality materials. All belts are constructed of genuine leather and come in a choice of plain or basket weave. The belt buckle can be nickel or brass. All Boston Leather belts combine durability, appearance and price to create an excellent value. I had been looking all over for this belt and finally found the one I wanted. I just love it, and I know it will last a lifetime. I am not in law enforcement, so this is an "Average Joe" opinion. Nice, heavy duty belt which holds my conceal-carry pistol much better than my 1.5 in dress belt. Fits all of my jeans and khaki shorts, but does not work as well on some dress pants. Please note: when I carry concealed, I get creak-ing sounds when walking because the leather is so thick. Bought wider loops for my kydex holsters which helped with the noise, but I think it just needs time to break in. It's not a huge concern, but in a quiet room, the creaking is noticeable. Not crazy about the buckle...seems very thin, but it can be easily replaced. Overall, very satisfied with the purchase. This is an excellent product. It is strong, durable and the basket weave is aesthetically appealing. I have purchased this belt twice and will certainly do so again in the future. I am 100 satisfied. Better than expected. Top quality heavy duty belt. Holds sig 220 in place with no issues. I received my garrison today and am very pleased with it. the shipping was great. Received it quickly I plan to order again in the future. Thank you CopsPlus for selling a great product. Ordered the 1.75 wide lined garrison received it today I am very pleased with it you will not find a better belt for the price. And the shipping was top notch, I plan to order again in the future. Excellent leather item. Wore out my previous belt(s) and needed a new one. Excellent service as expected. Great belt, Very good quality. The leather quality is less than I expected. It feels "plasticy". The buckle is fine. Good quality and workmanship. Will buy again if it ever wears out. Great and high quality belt. Like the look, but the size runs small. Great quality, just what I ordered. Great price too. This is a fantastic belt. I have looked high and low for a quality leather belt and finally I have found one. The service was awesome and the delivery was quick and efficient. Will recommend you to my friends. I love Boston Leather products. I have been in uniform since 1975. I have had to wear a number of different brands that were issued, but I always ended up replacing them with a Boston Leather belt. The quality lasts throughout the belt's life. It is always more than presentable in public. According to manufacturer, they ask to specify your exact waist size. 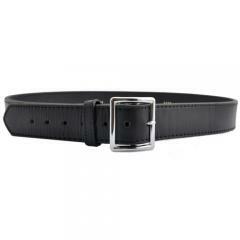 To determine your size from your present belt, measure from the center hole to the outer edge of the buckle. I do recommend going up one more size based on those measurements to insure a better fit.